What is unconventional gas? It is gas such as CH4 which is trapped within coal and solid rocks and which has been uneconomic or technically too difficult to get at until quite recently. What is coalbed methane? It is methane trapped within coal. What is shale gas? It is methane trapped within the structure of shale rocks. To get it out you need to fracture the rock. Why “Frack Free”? See here. Who owns shale gas and coalbed methane? You don’t. The Crown does. What is hydraulic fracturing, aka fracking? It is the process of fracturing either coal or shale to provide a way for methane to be released so that it can migrate to the surface and be collected. It involves injecting water, chemicals and sand into rocks at very high pressures. What is a PEDL? It is a Petroleum Exploration and Development Licence. Who are UK Methane? They are a UK company based in Wales who hold the PEDL licenses covering 450 square km in Somerset, including the Chew Valley. Who are Eden Energy? They are an Australian company who hold a 50% share in the PEDL’s covering the Chew Valley with UK Methane. Where are the proposed test sites? In Somerset UK Methane are currently looking at Hicks Gate near Keynsham, Ston Easton and Compton Martin, although there are no current planning applications. 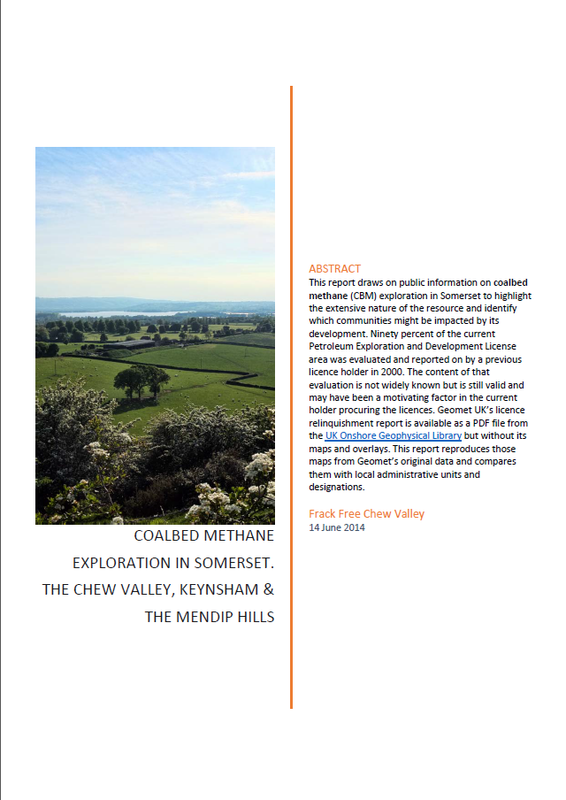 What are the benefits of unconventional gas production in the Chew Valley? Umm, huge profits for oil and gas companies. It is very unlikely that gas prices would change much if at all. What are the disbenefits of unconventional gas production in the Chew Valley? There are local issues to consider such as noise pollution, light pollution, heavy traffic, water consumption, water depletion (CBM), landscape impact, seismic impacts, cumulative impacts of all these factors. Nationally the key issues to consider are the diversion of resources away from low-carbon energy development, the potential for increased (not decreased) carbon dioxide emissions, spending money on what will become a stranded asset, incompatibility with our climate change commitments. Why don’t I already know about this? Because nobody told you and you didn’t vote for it. What does my MP think about it all? Mr Jacob Rees-Mogg has repeatedly said that he is “cautiously in favour” of unconventional gas development and production. Rees Mogg now seems to be enthusiastically in favour of unconventional gas development. What a strange move just 4 months before an election! Indeed – and the only real climate benefit we in the UK could get from unconventional gas is if it displaces a much more carbon intensive fuel. The only such fuels are coal and big biomass (eg Drax). But, by the mid 2020s we should have closed all our coal power stations and hopefully the wood-burners will have gone the same way. So just when fracked gas is coming on stream in volume (according to supporters), we won’t be using any coal for power generation. It’s also suggested that fracked gas will have a lower GHG footprint than imported natural gas because of the shipping emissions. If it does, that difference will be insignificant.